Philosophy Weekend: Are All Religions The Same? ... this lumping of the world’s religions into one megareligion is not just false and condescending, it is also a threat. How can we make sense of the ongoing conflict in Kashmir if we pretend that Hinduism and Islam are one and the same? Or of the impasse in the Middle East, if we pretend that there are no fundamental disagreements between Judaism, Christianity, and Islam? I went to hear him speak two months ago in New York City, and happily found Stephen Prothero to be more subtle and moderate in person than his publicity department probably wants him to be. HarperCollins may be trying to ride God Is Not One on the coattails of Richard Dawkins's The God Delusion and Christopher Hitchens's God Is Not Great. They even swung him an appearance on the Colbert Report, where, again, he came across as thoughtful and knowledgeable, and clearly no firebrand. Islam solves the problem of pride by emphasizing submission to a greater authority. Christianity introduces the concept of sin, and offers a path to salvation from this degraded state. Judaism is all about return from exile -- in both the personal and cultural sense. Confucianism offers an organizing principle for a disorganized world. Daoism provides a freewheeling alternative to an overly structured Confucian society. Hinduism offers a variety of vivid alternatives to the suffering of human existence. Buddhism attacks the same problem as Hinduism, but in a more psychological and intellectual way. Yoruba Religion offers a connection to the spiritual realm for an often-displaced people. Which of the following -- baseball, basketball, tennis or golf -- is best at scoring runs? The answer, of course, is baseball, because "runs" is a term foreign to basketball, tennis and golf alike. Different sports have different goals: basketball players shoot baskets, tennis players win points, golfers sink puts [sic]. So if you ask which sport is best at scoring runs, you have privileged baseball from the start. To criticize a baseball team for failing to score runs is not to besmirch them. It is simply to misunderstand the game of basketball. I think Prothero makes a great point here. But I'm not sure what to do with this point. Prothero is certainly not arguing for a greater intolerance towards variant religions (which is one reason I like this book better than Dawkins's or Hitchens's, both of which treat all religion with intolerant disdain). I'm not sure why several paragraphs in the introduction poke fun of new-agey religious types or hippies (or, again, the Dalai Lama). It's a fact that religion is the source of much violence, bigotry and genocidal hysteria in our world today, from Sri Lanka to Amsterdam, but unless I'm missing something, hippies really aren't the problem. 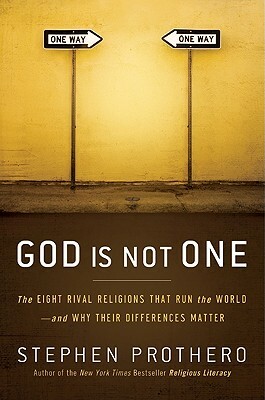 The chapters return often to the main point, the essential functional difference between each major religion, though it remains unclear what the author thinks we should do with this fact. Here's what I keep stumbling on here: assuming it's true that each religion serves a unique purpose, what's to say that an individual person born into one religion will need what that religion offers? What about a Moslem child who hates to follow rules, a Jewish child who does not feel isolated, a Daoist child who loves to put all his toys into their proper boxes and hates to see anything out of order? In the end, don't all of us have some need for what all of these religions offer? I'd like to know what you think -- are all religions actually unique, and if so, what should we do about this fact? This article is part of the series Philosophy Weekend. The next post in the series is Philosophy Weekend: The Four Types of Evil. The previous post in the series is Philosophy Weekend: Pacifism's Coma. 15 Responses to "Philosophy Weekend: Are All Religions The Same?" The solution is always a practical one that involves tolerance and not a great merge of belief systems. I do believe that the fringe of every religion is just soft enough to allow co-mingling with the fringes of every other religion. I am a member of the Yoruba tribe and while the majority of us are Christians, the traditional ways influence many many facets of our Christian faith. Great post as always Levi, methinks this philosophy series is a stroke of genius. Mysticism seeks to join, or unite, our inner self with the divine by spiritual disciplines of devotion, knowledge, selfless service, and/or meditation. What you do matters greatly to what you will become: that is divine justice. How you do it, through Buddhism, Christianity, Hinduism, Islam, Judaism, or outside these faiths is important when it is the right way for you: that is divine law. One is Truth: true Reality transcends the boundaries of our beliefs. Thou art That: you are in the divine essence; you must be dedicated to fully realizing it. Our religion may be right for us, nevertheless that does not mean billions of others are wrong. What of the 100 billion people who lived outside of our faith since the origin of our species? Religions do differ in approach, beliefs and practices, although the divine Reality they seek is the same. Their mystics used the words and concepts understood by followers of their faith, but these are just alternate ways of trying to express the One underlying Truth. I think the premise of the book is spot on. I have not picked up the book, and not read it, so my comments are only based on the impression from this article. I find the attempt to reduce all religions to the same spiritual premise to be a bit shallow. Either people will propose an idea like Pascal's god-shaped hole, which says that all people essentially need a god. Or people will argue something more complex: that all religion was revealed from the same deity, but the history has become jumbled by inadequate messengers. The former approach might be barely palpable to an atheist or agnostic perspective (perhaps this is the author's own), unless we put it into existential terms. The latter reductive approach cheapens the very real differences Prothero wants to point to. The "problems" Prothero identifies as the driving force of each religion are an interesting conversation starter, but a bit silly. The problems each religion addresses are much more intricate than a single thing. Which might be why the Confucian and Taoist chapters seemed lucid, while the chapter on the religion with which you are most familiar seemed lacking. I would agree that all religions are basically unique. I'd think that, as the world comes closer together, most people would begin to realize the subjectivity of their culture's belief system. I'd imagine this would either lead to an increase in agnosticism or a religious experience more open to dialogue or increased religious wars. Perhaps the good to come from not glossing over the differences is the simple act of accepting and even appreciating different perspectives regardless of your own? Good post. As to all religions being the same, I quote Mencken (sp): "For every complex question there is a simple answer. It is always wrong." My quick thought on this is that one major difference between Christianity and Islam and the other religions (or no religion) is that these two are evil, in that they demand submission to their principles (presented as divine laws) and punish everyone who doesn't cooperate - including non-believers. Two examples: Iran's stoning death for adultery; Catholics removing aid to the hungry in Washington because the district government is in favor of gay marriage. Hippies are always the problem. They ought to cut their hair. As I read this, I thought, what's the Yoruba religion? And I see you explained what it is. I think this is quite an interesting and apt inclusion on Prothero's part in that Santeria type beliefs are widespread. I've never seen it included as one of the major religions before, but in terms of absolute numbers of people who practice, adhere or have been influenced by it, I agree it is right up there with the others. I'd question more that he delineates Daoism, Confucianism and Buddhism. Confucianism can be argued not even to be a religion, but setting that aside, the three really are so mixed and merged I question the distinct categorization. Levi, does he address the theistic aspects of the various religions, specifically the monotheistic vs polytheistic aspects and how the underlying theology reflects or influences what you call the problem each one is specifically designed to solve? TKG -- yes, there are various considerations of monotheism and polytheism within the various chapters, though it's not a main theme of the book. I'm glad it's not -- that distinction probably gets more play than it's worth. Mayowa, that's interesting about your Yoruba heritage. I once had a good friend from Nigeria, a software engineer, who told me he was also of the Yoruba people, though interestingly he was a devout Christian. As to what irked me about that first passage I quoted: I guess I sensed it was playing to a familiar (and currently very popular) Christians vs. Muslims dynamic, maybe trying to tap into some jingoistic sentiments in order to sell books. Anytime I hear the word "threat" in the same paragraph as the word "Islam", a certain alarm goes off in my head. In this case, though, it was a false alarm. I'm a software engineer too, very strange. Most of the Yoruba people are devout Christians but you can definitely see the impact of the Yoruba religion on how much emphasis Yoruba Christians place in the spiritual realm including full blown belief in witches, wizards, etc. The alarm that goes off when you hear threat and Islam is a wonderful thing Levi. It has become too easy to conjure up fear using Islam and it does Muslims a great disservice. I think having alarms like that help us to test the easily digestible nuggets of BS that politicians, pundits and the media feed to the public. Keep the alarm. it kind of depends on how you define "religion." as an ex-academic, i know of another way to look at religions - what do people actually do. and when you look at it from this perspective (known in Religious Studies/Soc-Anth circles as "Little Tradition"), there are a lot of commonalities: offerings, sacred meals, pilgrimages, clergy, special clothing, chanting, taboos, and so on. if you leave out the dogma, they all seem similar enough that if you were an alien (as one of my profs suggested), you'd think there was only one religion on Earth. The way I see it, all the major (and so-called minor) religions do have basic beliefs in common, which keep them from being unique. All three of these beliefs can have their roots traced back to Nimrod of Babel- who had a hand in starting religion that was opposed to the true God. And it goes without saying, that none of these beliefs are Bible teachings. But most people don't realize that. Steve, I actually don't think all major religions preach heaven and hell. In fact I don't think any of the Eastern religions do. Immortality of the soul, I would agree, seems to be a pillar of all religion. Levi and Steve...Buddhism denies the existence of a soul. It's called anatman in Sanskrit. The principle that transfers from one life to another is more properly thought of to be a kind of consciousness. The best analogy for this that I've heard is like lighting one candle off another. The new flame is no longer the original, but there is something that transfers in between. Or, hepcat, is that the Buddhist soul? I guess it's a matter of interpretation whether we call the anatta/anatman/"no-self" a soul or not. And then there is the world soul, our collective self. Levi, as I understand it, equating the consciousness with the soul would be misleading as most people tend to think of the soul as something permanent and unchanging. This would be a form of self-attachment which Buddhism so strenuously avoids. That consciousness we associate with ourselves, like all things, is ephemeral. Though it is reincarnated, it is still a part of the cycle of birth and dying that is samsara. I confess I'm not sure what you mean by a 'world soul' in regards to Buddhism. We are all just manifestations of the same thing (i.e. emptiness or Void)? I'll go along with your reasoning on the anatta, hepcat. You're right at least to the extent that there'd be no point calling it a "no-self" if it were simply an eternal self. So, thanks for calling me on that. I do tend to lump the major Eastern religions together (they have so much in common) but you are right that the Buddhist concept of personal existence (or nonexistence) is unique and should not be overly generalized. Levi, I had a feeling that Hinduism was what you were referring to. I'd agree with your assessment of Brahman as a kind of world soul or collective self. Have you read any Joseph Campbell by any chance? He has quite a lot to say about comparative religion and mythology. He's probably the most erudite and insightful scholar I've ever read on the topic. I think that any attempt to reduce religions to the same ontology is futile and fruitless. Creators have no place in most eastern religions. True reality is transcendent and not created. Granted, they have gods of creation, but these gods are simply manifestations of that transcendent reality and as such are not real in the absolute sense. They are more rightly seen as gateways to the absolute. Try convincing a Christian that God is not real, but rather a symbol that refers to something unnameable. In my opinion, the Eastern religions have a far more sophisticated and well thought out ontology. Western traditions seem almost pedestrian in that regard, especially when it comes to the transformation of the mind. Buddhism especially tends to dovetail nicely with modern psychology and science. Western traditions tend to fight it. For me, trying to argue that all religions are same, from an ontological standpoint, is completely meaningless and misses the point. I think that debate is interesting but ultimately and practically leads nowhere. A more meaningful comparison is the pragmatic goal of religions, and this is where I think we can find some common ground. Religion is about giving peoples' lives a purpose, helping them cope with suffering, teaching them how to live in accord with their fellow humans. The ethics of religion differ in particulars, but mostly they agree on the major things: Don't murder, cheat, lie, steal. Have compassion. Touching on Levi's previous article, I believe that war is hardly ever about religion. Show me a religious war and I'll show you a war over land or resources. Religion just happens to be the common denominator that groups fall neatly into. No matter how often we hear how all Muslims are at war with the infidels and would rather them dead, it's simply not true. Palestinians aren't at war with Israel because they're Jewish, they're at war with them because they stole their land. 9/11 didn't happen because the extremists are 'freedom haters (God, I cringe when I hear that)', or because they hate Christianity, it happened because of the U.S. policy in the Middle East viz-a-viz Israel and our military bases protecting 'our' oil. No doubt, extremists will hate each other over religion. I have no doubt that Osama bin Laden hates Jews and possibly Christians, but equating that hatred as the reasons for war is a serious mistake and distracts from the more important point--geopolitics. Anyway, the biggest problem, in my mind, is that most people don't actually practice the religion they preach. I think I'll stop there before I start offending people. The first mistake of the naive psychologist or philosopher is to assume that the self must be a concrete, singular and persistent thing. In our everyday lives, we see that self is a shape-shifter. "What is this book? Hmm ... another Buddhist geological thriller? A secular spiritual epic?" An interview with Vanessa Veselka, author of the amazing debut novel "Zazen". In June 1997, I found myself in the middle of an impromptu Buddhist ceremony with a bunch of Tibetan monks and Adam Yauch. A memorial tribute to MCA, the "spiritual Beastie Boy", on the sad day of his death from cancer. Ellen Pearlman's "Nothing and Everything" explores the synchronicity between western Buddhism and avant-garde art in the 20th Century. Two illuminating (and short) philosophy videos, one on Alan Watts and one on Friedrich Nietzsche. New evidence of Siddhartha Guatama's birthplace in modern-day Lumbini, Nepal has just been discovered. The Bob McDonnell scandal was about much more than greed. If you ache to own a Rolex, you suffer from greed. If you ache to be seen wearing a Rolex: well, you are suffering from something, but it's probably not greed. Five verses from the Tao Te Ching, apropos of a hard day at work. A visual diagram shows the depth and complexity of the important philosophy or practice known as "pacifism". The author of Zen and the Art of Motorcycle Maintenance, the great 1974 novel about a father who takes his son on a philosophical cross-country journey, has died at the age of 88. The original 1952 New York Times Magazine Article that introduced the phrase "Beat Generation" to the world. You have to be careful writing about Gary Snyder, because he's such a Zen guy you get the feeling anything you write will be vastly inferior to silence.